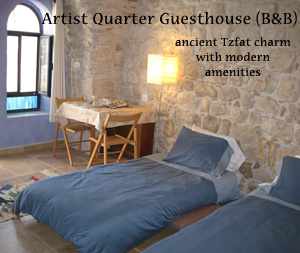 If you are looking for a place to stay with ancient Tzfat charm and modern amenities in the Artist Quarter of the Old City of Tzfat, the Artist Quarter Guesthouse is the place for you. Quietly situated at the end of an alleyway, yet close to parking, this guesthouse is centrally located--just a few minutes walk away from synagogues, galleries, the main shopping area and restaurants. The guesthouse has a private entrance and shares a courtyard with the friendly and helpful owners and hosts, the Strausses. The guesthouse is beautiful, clean and newly renovated, and is completely set up for shomer shabbat/shomer mitzvot guests. The walls and domed ceiling of the guesthouse are of stone, so you have a taste of classic Tzfat ambiance-complete with Moroccan lamps and beautiful stained glass in the arched windows and door. The airy room has incredible natural lighting, with curtains for privacy and for those who wish to sleep during the day. There are two single beds that can either be separated or connected together, plus a pull-out couch to accommodate more guests. There is a dining area to comfortably celebrate your shabbat meal or work on your computer using the guesthouse's free Wi-Fi internet connection. Central air conditioning and heating along with the thick stone walls regulate the temperature quite well. The kitchenette has a window looking into the courtyard, and is equipped with a refrigerator, electric kettle, shabbat hot water urn and electric hot plate. The kitchenette is stocked with coffee, tea, sugar and milk. Dairy dishes are provided as well as a considerable amount of disposables to avoid problems with kashrut. There is a private bathroom with soap, shampoo and conditioner for your convenience. To keep your things organized and out of the way there is a separate closet to unpack your belongings, hang clothes and place your luggage. There are candles and candlesticks for shabbat, as well as water basins and cups for ritualistic hand washing. Rates for two people are 350 shks/night or 400 shks/night for just Friday night. For each additional person the rate is 75 shks. Children of all ages are welcome, and children ages 2 and under are free of charge. Discounts are offered for longer stays. Arrangements have been made for you to enjoy a full breakfast a few minutes walk away at M Bagel restaurant on the main street of Tzfat for an additional discounted fee of 35 shks per person. The breakfast includes eggs prepared in any style, a bagel with cream cheese and butter, a salad of your choice and a large coffee, tea or cold drink. Their kosher certification is Mehadrin. In addition, the Strausses cater complete Shabbat meals from their kosher kitchen for their guests for an additional 100 shks per person per meal. Arrangements need to be made by noon on Thursday. Women are welcome to relax and enjoy a massage with Guesthouse co-owner, Joy Strauss. Joy offers a Swedish massage in which she incorporates acupressure, foot reflexology and craniosacral therapy into her massages. Joy's training is through the Holistic Health Program at the University of California at Santa Cruz. She works on women of all ages and with different physical issues. A one hour massage is 200 shks. To book or for further inquiries, please call 077-524-0235, cell phones 050-410-7469, 050-410-7468, or email [email protected] Also, please see more photos on our facebook page.